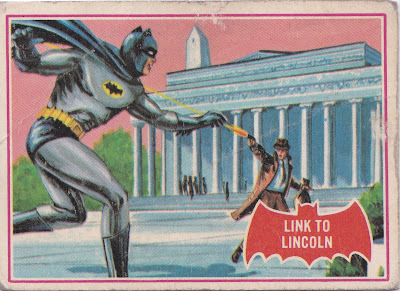 I've been slowly picking up any 1966 Batman cards I come across at card shows as they are some of my favorite non-sports cards ever made. I picked this Batman "red bat series" card at a card show in Annandale, Virginia today as it seems like an appropriate card for my time living in Washington DC. 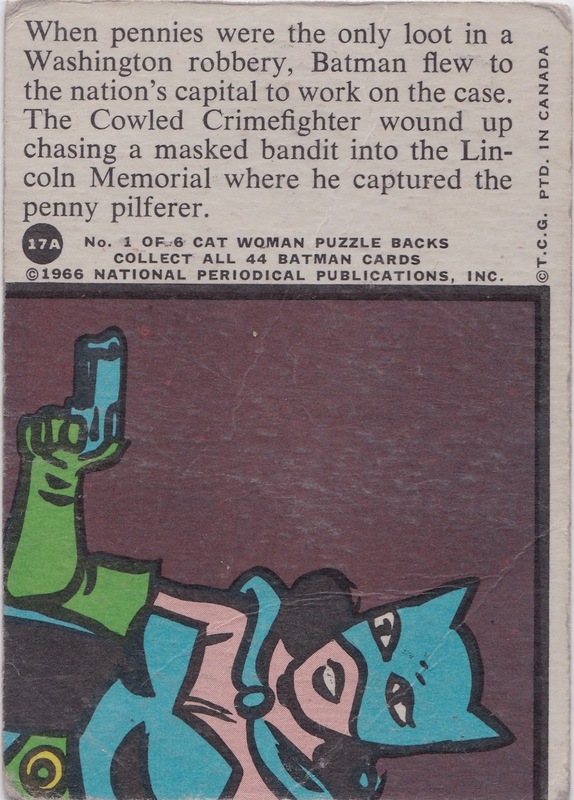 The reverse side explains the action on the front as Batman has traveled to the nation's capital to help catch a bank robber who only stole pennies. The robber made his way to the Lincoln Memorial in what I imagine is in honor of Lincoln being memorialized on the penny coin. But taking a look at the card again, you will notice that the top of the Washington Monument sticking out over the top of the Lincoln Memorial. If you've ever visited the Lincoln Memorial you'll know that this particular image is impossible. Here's the view of the front of the Lincoln Memorial and as you can see there is no Washington Monument visible. 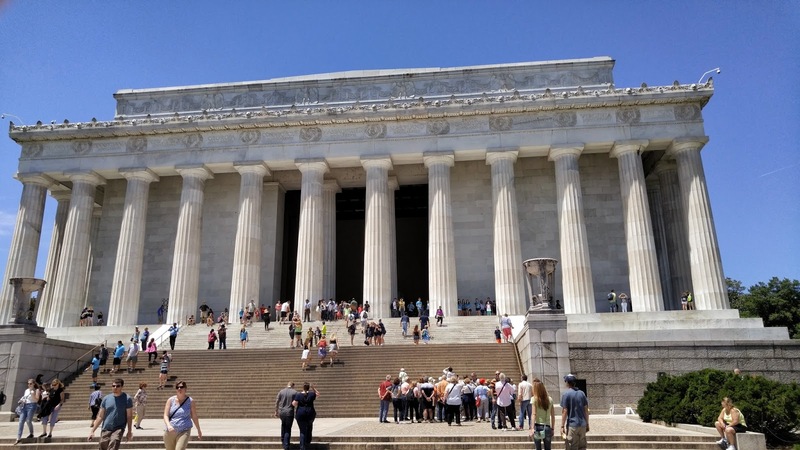 This is because the Washington Memorial is located directly in front of the Lincoln Memorial. Here is the view from the steps of the Lincoln Memorial looking across the reflecting pool. I thought maybe the artist used the reverse side of the Lincoln Memorial for the design of the card. But again you can't see the Washington Monument and the card features tourists and sidewalks, both of which the reverse side doesn't have. I think the artist of the cards (the famous painter Norman Saunders) included the second monument on the card to make it more clear that the setting was Washington. Either way, it is one of my favorite 1966 Batman cards now after spending some time in the capital. The biggest problem is actually the fact that I don't have a single card (from any color bat) in my collection. Good researching, I would never have known about the monument being in the wrong place. 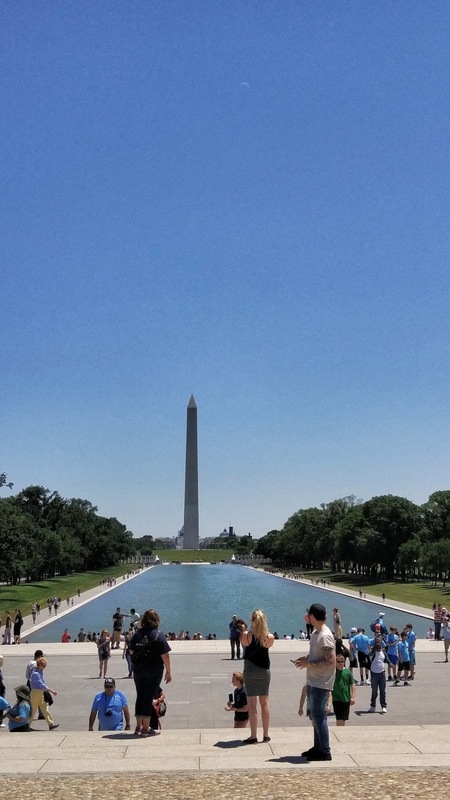 I've never been to Washington DC and while I'm sure I've seen the spatial distances on TV, I would never have remembered. These were first cards I ever collected as a kid. The artwork was so rich. 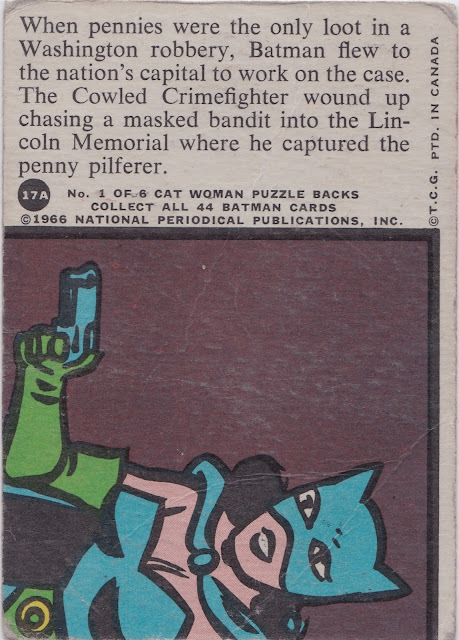 So there were puzzle backs on the very first cards I ever bought. That would explain my love for puzzle backs. I didn't realize that until I read this excellent post. Great detective work. Don't have any of the Red Bat cards (yet). But I finally picked up some of the Black Bat cards recently. I'll have to flip through the Red Bats and pick out a few for my PC.